Jeffrey Ryan Holsinger, left, sits in court Friday afternoon guarded by two deputies with the Highland County Sheriff’s Office. 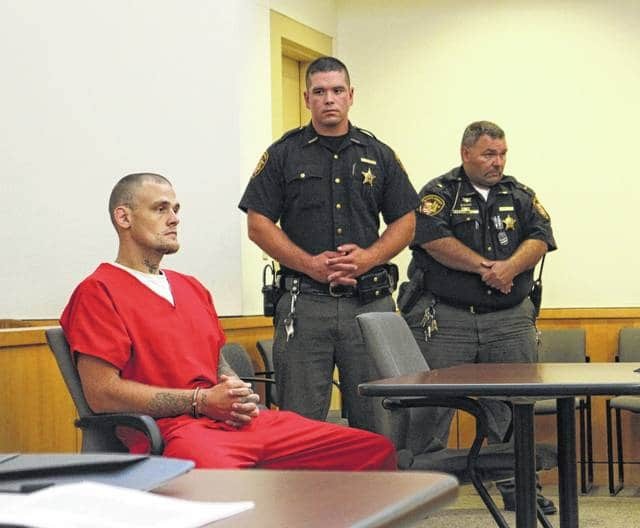 The man who allegedly shot three people, killing two, in a deadly Fourth of July crime spree appeared in court at the Highland County Justice Center Friday afternoon for an arraignment before judge Robert Judkins of Madison Township County Court. Judkins set bond at $2 million and appointed Hillsboro attorney J.D. Wagoner to defend Jeffrey Ryan Holsinger, 31, who allegedly shot and killed two people and injured another on the Fourth of July. The shootings happened just one day after the funeral of Holsinger’s father, who died in a freak accident June 28 after being struck by a wheel from a homemade trailer near Greenfield. The hearing, held as a special session of the Madison Township County Court, was held in the municipal courtroom at the Justice Center as a security measure, and some of those in attendance were searched before entering. Holsinger did not speak in court, other than brief replies to the judge, but when he was being led out of the courtoom, he spoke inaudibly to a woman in the courtroom whom he appeared to know. Holsinger will go before Judkins again in Madison Township County Court in Greenfield on Thursday, July 13 at 9 a.m. for a preliminary hearing. Holsinger is charged with aggravated robbery, a first-degree felony, and faces up to 15 years in prison on that charge alone, according to Judkins, and Highland County Sheriff Donnie Barrera said more charges will be filed as the investigation continues. Holsinger was transported to Highland County and questioned by Highland County Sheriff’s Detective Randy Sanders and Ross County detectives Wednesday evening regarding the shooting deaths of Steven Mottie, Jr., Greenfield, and Paul Robertson, 79, Clarksburg. Another victim, Jesse Lytle, 23, was taken to the Greenfield Medical Center and later transferred to Columbus by medical helicopter late Tuesday. Barrera told The Times-Gazette after the hearing that a female who was allegedly with Holsinger early in the evening the day of the incident is an integral part of the case, and has been questioned by detectives from Ross County. Barrera said he’s not sure what her involvement was, although she was believed to be with Holsinger voluntarily, then escaped him later on. Barrera said she was briefly treated at Adena Greenfield Medical Center and released with no injuries. Holsinger’s arrest came after Mottie was found shot to death in a bathroom in a home at Higginsville near Greenfield Tuesday, and two other shootings in Ross County, resulting in Robertson’s death in the 400 block of Browns Chapel Road and injuries from gunshot wounds to Jesse Lytle, 23, in the 8000 block of Rapid Forge Road. Barrera told The Times-Gazette that Holsinger was apprehended in Hilliard, Ohio, after he was trapped after pursuit by a police helicopter. According to online incarceration records, Holsinger was booked into the Southern Ohio Correctional Facility in January 2010 for receiving stolen property. He was booked again in April 2010 for aggravated robbery. In August 2010, Holsinger was charged with a third degree felony charge of escape. Holsinger was released in August of last year, according to records. He was on five years’ post-release supervision. https://www.recordherald.com/wp-content/uploads/sites/27/2017/07/web1_holsingercourt.jpgJeffrey Ryan Holsinger, left, sits in court Friday afternoon guarded by two deputies with the Highland County Sheriff’s Office.